France is a beautiful country containing world renowned museums, historic structures and picturesque vineyards. Checking off the must see sights in France is an amazing way to travel, but if you are looking for a beach holiday where you can be as kind as possible to your wallet, these cheap beach options may just be what you need. Ile de Re is a well-known island off of the west coast of France and is extremely busy during peak season due to the beaches and quaint beauty. Here you will find 60 miles of cycle lanes around the island making it ideal for anyone interested in exploring the area, with the beach never too far from you at any given moment. To keep costs down, check out Camping Interlude or Antioche which offer great sights to pitch your tent at appealing prices. Ile d’Oleron is known as the “poor sister” to Ile de Re. It has a much more relaxed feel and is not as busy with tourists. The food is cheaper and, unlike Ile de Re, there is no hefty toll to the mainland. There are also amazing campsites here if you check out The Indigo Chain where you can choose from sea front pitches to regular pitches that sleep up to 6 people. Camping is not for everyone though. If you are looking for self catering apartments, head southwest and book your stay at Côté Océan where you can find rooms for 2 people for €70 per night when staying for three nights or more during the low season. In Angoulins there is plenty to do for the entire family like exploring the nearby beach or having a low key day by the swimming pool. 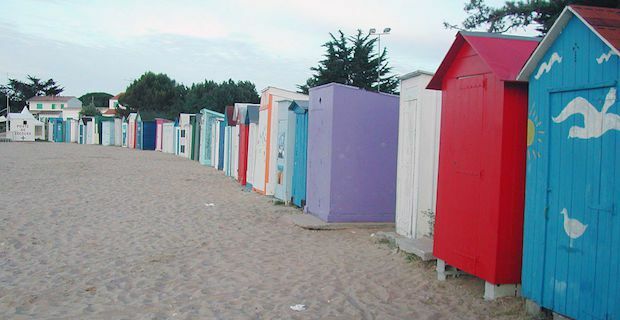 For a unique experience, stay at the camping village of Panorama du Pyla in Arcachon. You can rent accommodation or choose a camping pitch with a sea view. The area is in the middle of a 15 hectare pine forest making for a peaceful and relaxing stay. Wake up and explore the dunes and sea that are at your doorstep with pitches starting at €20 or cabins for four starting at €141.